Cheapest Oil presents a UK home heating oil price tracker. Compare your home heating oil usage with others, - your CO2 output - how much your boiler might be wasting Produce historical graphs for home heating oil prices. 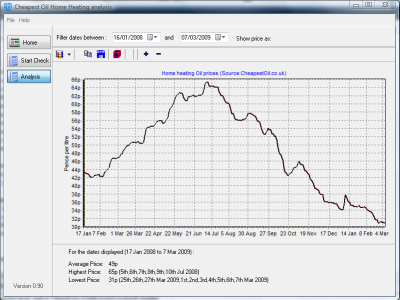 - Set date ranges and various parameters to customise the graph - find out average pence per litre for UK heating oil for your date ranges - Can automatically download the latest price data from the Cheapest Oil website This program requires an internet connection to download the latest pricing information and charts. No adware or third party applications are installed. This is an initial release. Download this freeware and help shape future versions. This program is completely free for non-commercial use. Please get permission before using any output from this program for commercial use. It is a prerequisite that you quote the Cheapest Oil when using any data contained within the application.